Ranging from Completely Pointless to Pretty Useful. But Mostly Pointless. Is this the shortest IOS command? I don't use HSRP often, but it does fill a very handy gap in certain situations. I had a strange scenario recently with mulitple HSRP groups and a static route which wouldn't behave. So that's fine isn't, we have R1 as "priority" for group 1 and standby for group 2 - vice versa for R2. Note the "use-bia" command, this is required when, as Cisco say, "controllers in low-end products can only have a single unicast Media Access Control (MAC) address in their address filter. These platforms only permit a single HSRP group, and they change the interface address to the HSRP virtual MAC address when the group becomes active. Load sharing on platforms with this limitation is not possible with HSRP." Which is exactly what was happening - despite HRSP being completely aware of changed priorities, without use-bia multiple groups did not function. Crucially of course it breaks the routing, this static route kills the path, I really wanted IOS to be clever and ignore the command. This was the whole point of the post however its not all that great a point I suppose, just a curio. Today I had yet another instance of EEM script saving the day - or at least proposing a solution which might one day save the day. I desperately want to monitor a sip-ua registration on a Cisco gateway, something was up with one of my gateways and it would spontaneously stop registering. And not start again, which is deeply not funny when you are on call GMT-time and they are in Australia. The only solution was to remove reapply the sip-ua config, which turned out to be an IOS bug, I believe. However going forward and moving on to the brighter, less-buggy future how could we monitor the trunk going down if this happened again? As it stood we relied on irate punters to sound the alarm - as we all know being forewarned of an impending angry caller is far more preferable to ignorance as you can magic up brilliant sounding diagnostic measures in advance (reboot it). Was there a MIB to show this status however so we could beat them to it? I couldn't find one. Enter EEM. action 100 cli command "en"
action 200 cli command "show sip-ua register status"
action 250 foreach line "$_cli_result" "\n"
action 400 if $_regexp_result eq "1"
action 600 syslog msg "The trunk is down"
Finally add in an action 601 to send the monitoring solution of your choice a custom trap, if the result is positive, and yes we have an alarm should SIP trunk not be registered. Happy days. I often use the Cisco embedded event manager to automate tasks such as applying diverts on timers etc. Using a cron-entry this works very well, though I always test the script in GNS3 first before applying. One slight issue has bothered me is having to return to the device and tidy off the script so it doesn't run again the following year. What if you told the script to delete itself, would it still work? action 2.0 cli command "config t"
action 3.0 cli command "voice translation-rule 89"
action 4.0 cli command "rule 5 /0121111111/ /3900/"
action 4.1 cli command "exit"
action 4.2 cli command "no dial-peer voice 3420 voip"
action 4.3 cli command "no event manager applet update_divert"
action 5.0 cli command "exit"
action 8.0 cli command "exit"
*Mar 1 00:05:01.955: %HA_EM-6-LOG: update_divert : DEBUG(cli_lib) : : CTL : cli_open called. *Mar 1 00:05:02.079: %HA_EM-6-LOG: update_divert : DEBUG(cli_lib) : : OUT : Enter configuration commands, one per line. End with CNTL/Z. *Mar 1 00:05:04.591: %HA_EM-6-LOG: update_divert : DEBUG(cli_lib) : : CTL : cli_close called. A quick check of running-config and yes, everything is updated and the script removed. Nice and tidy. event syslog occurs 1 pattern "user: drdoom"
action 1.0 syslog msg "Dr DOOM IS COMING!" action 3.0 cli command "conf t"
action 4.0 cli command "int fa 0/0"
action 5.0 cli command "ip add 2.2.2.1 255.255.255.0"
action 6.0 syslog msg "DR DOOM INTERFACE RECONFIGURED"
action 1.0 syslog msg "MISSION ACCOMPLISHED"
action 3.0 cli command "int fa 0/0"
action 4.0 cli command "ip add 2.2.2.2 255.255.255.0"
action 5.0 syslog msg "DR DOOM RECONFIGURED THIS ROUTER"
This worked pretty well, Dr Doom succeeded in his dastardly plan, but it barely scratches the surface of either IP SLA or EEM, merely one practical use. Ping however is not a great decider to be reconfiguring links by, so use with caution - pings can be lost for any number of reasons. If you tune the parameters though you can introduce a greater degree of certainty, in this case my track object has a delay to 20 seconds before it is considered down, with a frequency of 5 seconds. If you were doing this during an agreed change window you could also impose life restrictions on the ip sla schedule so it only started at the right time. Everyone wants a toy ASA to practice on, right? 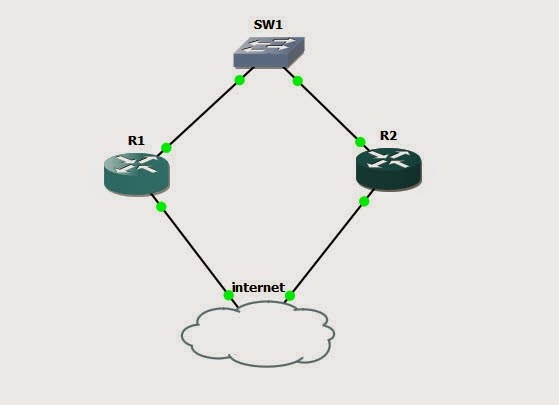 Well you can with GNS3. This took me about 4 hours to get right. Previously I had this working on a Windows box, however transferring the settings was far from pleasant. In fact they just didn't work. First, for some reason I am using Ubuntu 10.10. I just like it, it is out of date, but still it works for me. In order however to get GNS3 running on it I needed to install the new 0.8.3.1 package from source. Well I didn't need to, I wanted to. 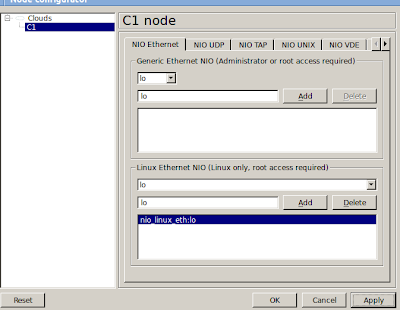 So this meant removing the working GNS3 installed by the package manager and running the new GNS3 from source. Anything but the above was causing it to fail. Ok so. 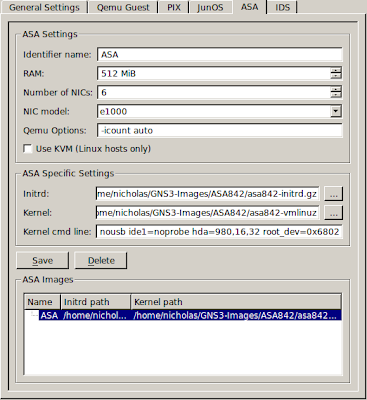 You have a working ASA, but you want to use the ASDM, right? Basically then you are going to have to tftp the ASDM software to the virtual device, so next we have to create a loopback node, have the ASA connect to that network and then do the needful. ASDM software, you will need the username/password above.